After a thrilling World Cup and a summer full of exciting transfers, the Premier League is finally back. It all kicked off with a 2-1 Manchester United win over Leicester City on Friday. Paul Pogba scored an early penalty gave the Red Devils a 1-0 lead and Luke Shaw scored his first Premier League goal in 104 appearances to make it 2-0. Jamie Vardy scored a late goal to make it 2-1 and the first game of the year was over. Wolverhampton Wanderers’ first game in the Premier League since 2012 was a thriller as a late goal brought Wolves level to a 2-2 draw. 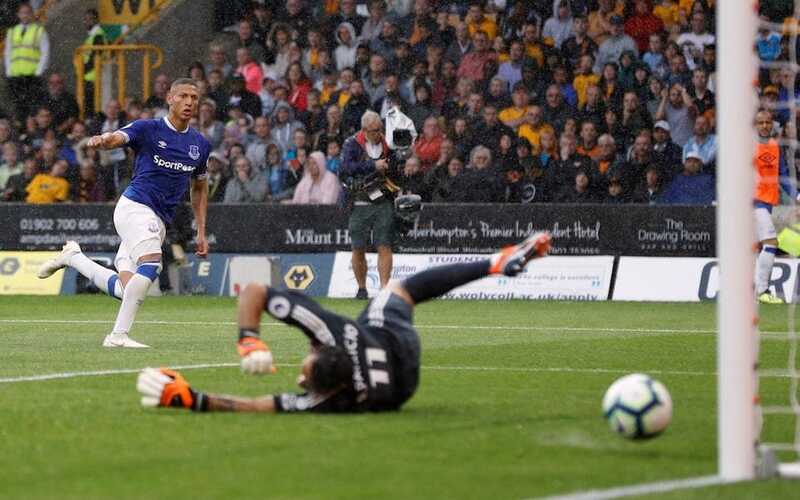 It didn’t take long for new signing Richarlison to score his first goal for Everton, as he slotted a loose ball into the back of the net to give Everton a 1-0 lead in the 17th minute. Everton’s Phil Jagielka put in a poor challenge after sloppily losing the ball in the 40th minute that resulted in a red card. Four minutes is all it took for the Wolves to equalize, as Ruben Neves curled a freekick into the top right corner to make it 1-1. Both teams continued to get chances but Everton broke through in the 67th minute from a beautifully low curled shot to the far corner from Richarlison to earn his brace and give Everton a 2-1 lead. This lead wouldn’t last however as Neves curled a ball into the area finding Raúl Jiménez to head the ball past Jordan Pickford to bring the game level at 2-2 in the 80th minute. It didn’t take long for Liverpool’s Mohammed Salah to get on the scoresheet this season, as he gave Liverpool the lead in the 19th minute. Sadio Mane added two more for Liverpool and an 88th-minute goal from Daniel Sturridge helped Liverpool get off to a hot start with a 4-0 win over West Ham. With Naby Keita and Alisson making their debuts, and Xherdan Shaqiri coming on in the 82nd minute, Liverpool’s signings made great first showings. New Arsenal manager Unai Emery will have a lot to think about after being handed a 2-0 loss by 2017-18 Premier League Champions Manchester City on Sunday. Playing a very familiar 4-2-3-1 that Arsenal played under Arsene Wenger, the Gunners suffered a tough loss to City. Arsenal looked the same and Petr Cech is struggling in Emery’s ‘play it out of the back’ system—though not starting some of their best players shows Arsenal can be better. Youngster Matteo Guendouzi put in a great showing—aside from his defending against Raheem Sterling who scored the first goal—but Arsenal will need to fix things before they face Chelsea next week. Chelsea put down Huddersfield Town 3-0 with no problem Saturday. New manager Maurizio Sarri should be pleased with how his side played in his first Premier League match, as they dominated the Terriers for the full 90 minutes. A wonderful goal from N’Golo Kante, a debut goal Jorginho, and a late goal from Pedro saw out the 3-0 win. Eden Hazard came on in the 76th minute and played like his World Cup form never ended. Chelsea put in a strong performance and will look to carry the form into their match against Arsenal next week. In their first game in the Premier League since the 2013-14 season, Fulham suffered a disappointing 2-0 loss to Crystal Palace. Fulham is one of the newly promoted sides with a lot of hype around them as they made brilliant singings in the transfer window like Jean Michael Seri, Andre Schürrle, and more. The new signings weren’t enough in their first game, however, as they lost to a Palace side that has been a constant middle to low table team in the Premier League. Fulham will need to find chemistry and passion in their fixture against Tottenham next Saturday. The big money singing for Everton put on a fantastic performance against Wolves, scoring a brace in his debut. Reunited with Marco Silva from Watford, the £50 million man showed he’s worth the price tag with both the goals in a 2-2 draw. The Brazilian scored a scrappy goal from Leighton Baines free-kick, but his second goal was a brilliant finish to the bottom far corner. Everton has a lot to look forward to with their new singing this season.